Who are we called to be as Jesuits? This is a pretty big question. As individuals, each one of us can talk about who we are and what defines us. For example, I love the Beatles, Arcade Fire, the Philadelphia Flyers and Pope Francis. Anyone who meets me will end up hearing a lot about those things. But some aspects of identity are more difficult to talk about. My particular vocation as a Jesuit is deeply a part of me … yet not easily communicated. When people ask about it, I usually offer something like, “I am who God is making me,” or, “I’m work in progress.” But such simple replies cannot convey the whole story. In Pope Francis' recent interview, he was asked, “Who is Jose Mario Bergoglio?” The Pope paused before giving his answer. Like a good Jesuit, Pope Francis wasn’t afraid to make his interviewer wait while he discerned a good response. Francis' reply was surprising: “I am a sinner.” This became one of the most quoted lines in the Catholic media. The Pope was inspired by St. Matthew. 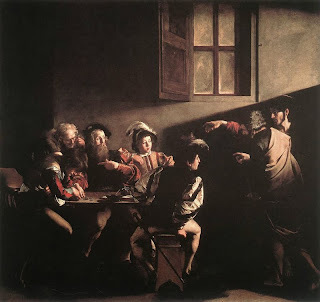 More specifically, the inspiration came from a Caravaggio painting which can be found the Church of St Louis of France in Rome: “The Calling of St. Matthew”. Or to say it another way: I heard the phone ringing, picked it up, realized it was for me, and gave it to the nearest younger person next to me saying, “It’s for you.” It was easier for me to just keep doing what I had been doing before and ignore the call. Of course, the phone kept ringing. I was able to ignore the call for a few months, but after a while, what else could I do but pick up the phone and answer? A good start; that’s all my response to this call is. In last week's readings, St. Paul reminded us that although we may be following Jesus with all our hearts, there is still much work to do. Virtues do not spring up whole, they need to be cultivated. Virtues like “righteousness, godliness, faith, love, steadfastness, gentleness, patience, meekness” (1 Tim. 6:11) and “carrying people in our love for them” (Eph. 4:2). What this means for me is that even after we’ve answered the call to be Christians it becomes our life’s work to cultivate these virtues more and more in our daily lives. We are continually called, even as sinners, to be closer to Jesus, to grow in zeal for God, and to deepen our love for our sisters and brothers.